They have provided a list with the locations and the number of stoves in each location, plus enrollment figures. Mary's Meals is currently working with 88 primary schools. One school has over 8,000 pupils. 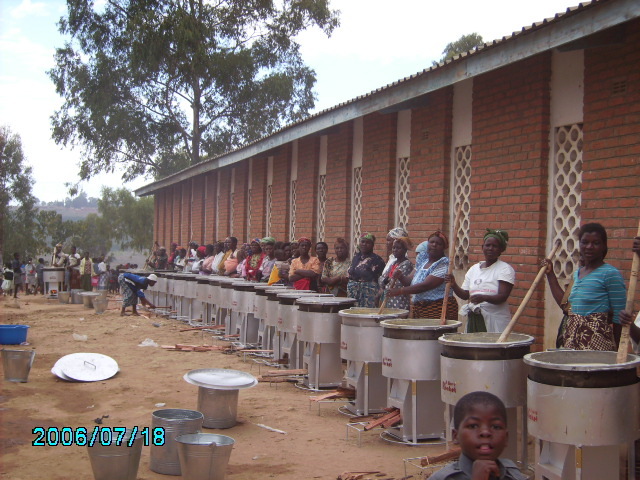 This school has 25 stoves which are used simultaneously (see photo). In the primary schools they calculate they serve 330 pupils out of a 120 litre pot. They provide as many pots per school as needed according to the enrollment. As of May 2007 a total of 176,000 primary school kids are being fed. Each pot is normally only used once per day on weekdays, even in school holidays. So each pot is in use on average 22 days in one month throughout the year. Unlike other school feeding programs they don't restrict their feeding to the times of food shortages. The pupils go to school at 6 AM, normally without any breakfast. Sometimes they get some cold leftover food from the previous day from home. But normally nothing is cooked for the pupils in the morning before they leave their home. At school, the first break is at 9 AM. At that time the junior classes get their porridge. The senior classes start at 10 AM. Both Florian and Peter reckon that our guess of 45% cooked food provided through the stoves is a pretty realistic scenario. They will receive a PhD nutrition student in July 2007 for 6 weeks who is supposed to do research on the nutrition the children receive through the feeding programmes. According to international standards for Sub-Saharan Africa the daily requirement of a primary school child is calculated at 700 kcal/day. Mary's Meals (MM) provides them with Likhuni Phala which caters for 36% of their (theoretical) daily calorific need, 50% of their protein requirements and 100% of Vitamins and Minerals. In some cases the food supplied by MM may be the only cooked food a child receives, e.g. there are also single/double orphans whose only cooked food is the meal at school. For those kids MM allows a second helping so that they can get more nutrition. Some pupils even take porridge home for their family. In the 40 under-5-year-old shelters they use double pot-stoves, which can serve 213 rations per cooking for the porridge. Those stoves are also used to cook a lunch-meal so that children get two servings (porridge in the morning, then nsima and relish at lunchtime). A total of 3,800 children get 100% of their cooked food out of these stoves. They claim that all their stoves are in use as their monitors are supposed to visit each and every school 1-2 times per week. They have 10 monitors who move with motorbikes, and they will be increasing that number in line with the expansion plans, especially in northern Malawi. In the urban areas it is difficult for the pupils to contribute firewood, therefore MM buys the firewood and delivers it to the schools. The schools had to build shelters and lockable storage facilities where they keep the stoves, flour, firewood and cooking utensils. So MM monitors the firewood consumption closely. Previously they used 1,5 cbm per pot per month, now it is down to 0.5 cbm. This translates into a wood saving of 1 cbm per pot per month. Over the year this sums up to 12 cbm per year x 535 stoves currently in use it comes up to 6,420 cbm per year. MM has currently 10 monitors that travel with motorbike to visit the schools on a regular basis. They try to visit each school once per week, whenever possible even twice per week. They have weekly meetings at the head office in Limbe. Should there be a problem with a stove in a school, the problem is reported by the monitors to them and then the stove is brought back to the MM office. It is repaired by the manufacturer if it is still within the warranty period of one year. Likhuni Phala (porridge) - a maize meal that is fortified with Soya and vitamins. See recipe by Stacia Nordin on ProNutrition listserv. Nsima - Nsima is thick starchy porridge made from corn, cassava, or other starch flour. (for example, the corn flours in Malawi are ufa woyera and ufa ngaiwa. Ufa woyera is maize flour which has first had the outer kernel shell and seed germ pounded off, leaving just the starchy part of the seed. Ufa ngaiwa is the whole corn kernel). The nsima porridge is formed into hamburger-size patties by scooping the porridge with a wet wooden spoon and flipping it onto a plate. The patty congeals in contact with the cool wet spoon and plate. Marble size pieces are broken off and rolled into a ball in the palm of the hand with the fingers. A final dimple is pressed into one side of it. It is then dipped in ndiwo (the sauce of vegetables or meat) See Friends of Malawi Recipes and the Sikunu Cookbook of Traditional African Foods or Nshima in Wikipedia.